As Gary mentioned Iowa City seems to have quite a few MINIs in its midst. Since only a few (2) regularly attend EIM events we'd like to try and round up some more MINI enthusiasts who maybe haven't heard of the EIM Group, and how much fun we have. 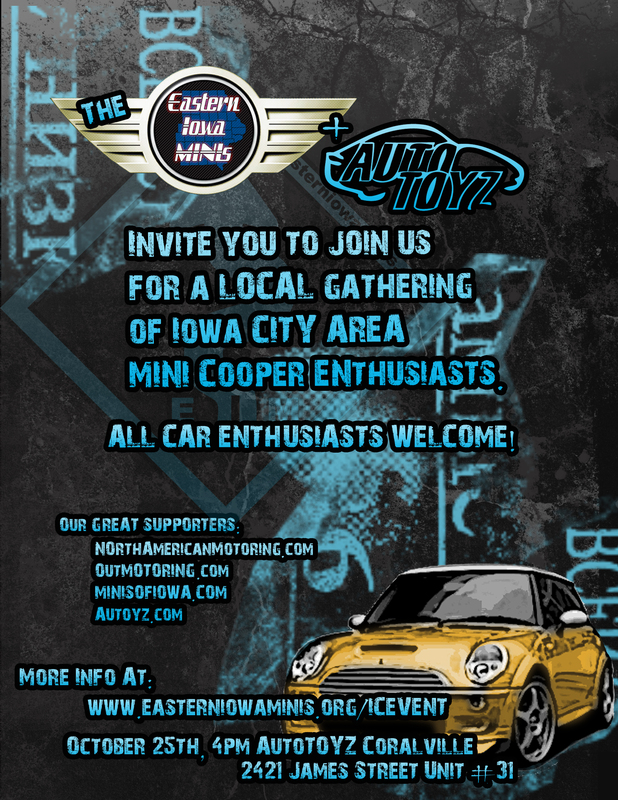 In any case, it's time to Round Up those Iowa City MINIs and get together for some MINI fun. Sometime this month in October before it gets cold I'd like to use up saturday evening for a meet and greet (Planning on the 18th even though the poster below says the 12th). In any case, I have made up some fliers that I will get printed up to post in various auto stores and other venues in the Iowa City area. Once again I currently have the 12th listed cause I just wanted to fill in a day but here they are. I hope everyone can try and make it down to welcome any new MINI enthusiasts. Brian and I will be trying to coordinate and tag as many MINIs in town with the info but we can use all the help we can get so spread the word to anyone you think might be interested! Ooh the 25th isn't a home game and might be a better date to do it. Gives us more time to get the word out and less of chance to loose people to the game. Ill have the update posts up here in a little bit with the date for the 25th if that works for you Brian. We might want to wait till we get back proper word from AutoToyz before printing anything too..make sure the 4pm time frame and all works for them too..
Last edited by R56MINICooper; 10-09-2008 at 07:03 PM. Hey, I'm in the Quad Cities and want to play! I'm scheduled to pick up my new 09 MCS on the 20th. So the 25th sounds good to me. I look forward to meeting all of you from EIM's! I could honestly seem this turning into more than just a MINI thing but we'll see. I am gearing it for MINI but I think AutoToyz would like to see it be for more, which if thats what they want I dont care as long as we get some more MINIs involved! A warm EIM welcome to you! Hope your MINI makes the delivery deadline; we'll all be anxious to see it (and will try not to drool too much). But in any event, please come on out so we can greet you. AutoToyz is all in. So we are good to go for 4pm on the 25th. Now we just need to distribute some fliers. Now to scout out those MINIs in town. i will try to make it!!! you better believe that i'll be there, unless for some unseen reason i'm not in town... but shouldn't be. i'll even ask for the afternoon off!!! cant wait to see everyone. I talked to one of the 2 guys that work with me that have the Acura's today and he said he'd try and make it. We are both off of work around 3 so, should not be an issue making it if it is at 4. I can't wait to see everyone again. ^^ Cool if you think it'd be ok there I can bring by a flier to hang up or set on the counter or whatever for others to see. I need to get them out this weekend to whomever will hang them. I'd be glad to. I could care less if sears does not want them up or not. It's for a good cause!! I'll be at work until 1 tomorrow than up to CR, till 2 on thursday and ummm... 4 maybe on friday. so bring them on over HR. If I can Ill bring one out tomorrow around noon time, drop it off and grab some Clay Pot for lunch. Just remembered I have an eye doctors appt today so I wont be heading out there. Hopefully I can get one to you soon. I put up mine at sears that you left last night... not sure who to thank for dropping one off since I was not there..... I think I got 3 guys that will show up from work (non-MINI drivers but still good guys). Can't wait to see everyone. I dropped it off last night, went around to a few places Thanks for hanging it Non MINI people are welcome but I hope to at least have a couple new MINIs. Hoepfully. The goodies are rolling in for the event So make sure to try and round up some new MINI enthusiasts in your are and bring them out! Bit of a dilema...just got a call from AutoToyz they let me know they close at 4pm on Saturdays..which is when the event was scheduled to start, so...If you want to shop at all please show up at 3pm. I will be there at 3:00 with some goodies so feel free to stop by and shop their showroom and get some free stuff and then hang around for the 4pm get together time. And even more of Dilema just got some rather bad news about my Mom so I am going to have to completely ditch out of the event on Saturday. Thank goodness Brian is still able to make it and I will be handing over all the swag to him for distribution. Thanks everyone and we hope to see you soon. Sorry to hear that you got some bad news about you mom HR. hope everything is well. See you on the next round. Got the swag tonight and its pretty cool stuff !! Thanks again Brian for grabbing the stuff Yeah the little EIM Vinyls were some extras I had, didnt get time to get the big ones cut here in Town so Ill work on those for the next event. Quick Reply: Iowa City Roundup!